Damn. I’m way behind. It’s August and I still haven’t put down everything that happened out in Alaska. That very fact has been stopping me from writing about all the other stuff that’s happened this summer. Maybe I’ll get there eventually. I’ve been on a CTC Mountain Bike Leader course, Emily’s swum the length of Lake Zurich (that’s 26.4 km! photos here), we both swam across Lake Geneva, and the riding’s been laid back fun. All of which deserves some words, but may only get photos, if that. So, time to get the snowy monkey off my back, then I can resume the normal waffle. Buffalo Camp is a hunting outpost that doesn’t get many hunters these days, but Bill pays them to keep the camp there for us riders. 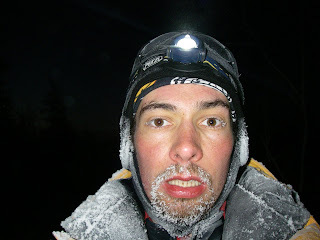 Coming in an area that is often the coldest part of the race, it is a massive relief to get there. What happened to me when I got there, I’m not too sure about. I was so tired that my mind was in and out. I had planned to have something to eat before I slept but I don’t remember if I managed much. I do remember trying to make some couscous but being defeated by the wood stove and not managing to get the water hot enough. Poking the logs ineffectually, I reflected on how un-Ray Mears I was. The darkness was swallowing up my mind and the water wasn’t getting any hotter, so I dumped a bag of cold water and couscous into the pot on top of the stove and lay down. I half-convinced myself that I was just going to wait for the re-arranged wood to get moving, but in reality I knew I was going to sleep. The next thing I knew I was surrounded by other racers. I had dropped off with only Billy, Lou, and Eric around. I had no idea where my gear was or how long I’d slept for. This wasn’t my finest hour. As we got ourselves ready to go, Billy was pretty cheerful. He’d piled up my strewn out stuff and we were going to fuel up before getting back on the bikes. My couscous had cooked (and the bag had melted to the pot a bit, but I got away with it) and Billy had lentil curry. We stuffed down our butter laden food, sharing the meals between us. As I left Bison Camp, I actually felt good. I’d borrowed Lou’s pump to sort out my tyres and topped up Billy’s front as well. Soon we’d be at Nikolai and within striking distance of the finish. The trail was similar to what we’d come in on – well packed snow-machine trail swooping up and down over little hills. Billy kept falling back and eventually we decided to just take it at our own paces. I was attacking each rise and fall of the trail with eagerness born of knowing I was going to make it to McGrath. After a while, I saw a pair of eyes up ahead on the trail. They hovered above the shadows of long legs and I thought it was strange to see someone with completely unreflective clothing. Then I realised it was a moose. I stopped way short of the beast – they have a reputation that I didn’t want to mess with. It turned and carried on down the trail, with me rolling after, still keeping a distance. Eventually it turned off the trail to go on its way and I could get back into my groove. Spinning through the night, I felt acutely alone. Having been with Billy for the last few days, I missed his company and doubted whether I should have left him when he was struggling for speed. We’d made our choices though and he’d seemed happy with it so there was nothing to do but pedal. Ghostly cracks rang out around me as the top layer of encrusted ice on the surrounding snow shifted. Each noise jolted me with adrenaline and awareness, but each time I settled back into making progress. After a few hours, I needed to poo. A featureless tundra is not the ideal place to have that need, but I knew there were occasional trees so I just had to wait. Eventually, I saw one and pulled to a stop. Down jacket on, I stomped off the trail to a lone tree. Unhooking bib-longs is awkward at the best of times, and had to be done super-fast out here. I did my business, buried it and moved along with no new frostbite. I had been moving at a high pace and effort for hours and there was still no daylight. I started to feel fatigued in mind and body – I knew I could keep going but I had an intense longing for the sun. The picture below was taken to see if I looked as bad as I felt, which I pretty much did. I was riding robotically in my down jacket, generating little heat but still approaching Nikolai and that was all I could do. As it always does, the sun came up. I kept moving and expected nothing else. I could keep this up and get there when I got there. In the end, I was so patient and unexpectant that it was a surprise to see a power line across the frozen river that I reached mid-morning. I had made it to Nikolai! Once again, the welcome was warm. I grabbed some food and water, could have slept, but I just wanted to get to McGrath now. Whether it was going to take a bivvy or not, I wanted to move on and see things though. Before I left, though, Kathi phoned to find out if I expected to be at McGrath for breakfast. The word was that the trail was good so, perplexed, I said yes and was soon back on the trail. Riding in the mid-day sun, it was so warm that I even rode without a jacket for a while. I felt light and free. I could walk the last 50 miles if it came to it, so if I kept my head the finish was in the bag. My happiness (and lack of coat) didn’t last long, though. Any breath of wind was chilling without an outer layer, and back on it went. More worryingly, the trail was mush. It was far too warm and the snow was too soft to ride. I could see John Ross’ tracks and he had been able to ride this stuff earlier, rubbing salt into my frustration. After a brief hissy fit, I just got on with it. I would have been better sleeping at the checkpoint and joining the trail by night, but there was nothing I could do about it other than walk. I left my GPS on and in front of me so that I could see my crawling progress. After a few hours, Tim and Tom strode past on their snow shoes. They were sympathetic, but annoyingly jolly before they made off into the horizon. The day wore on and I’d walked over 15 miles dragging the useless lump of my bike. My GPS was said that I was approaching 26 miles to go and that meant there was only a marathon left – easy. Not long after that, I saw a signpost: 35 miles to McGrath. My will was broken. I was going to sleep before I got there and I might as well sleep now. I could sleep until it got cold and dark, then have the chance to ride a firmer trail. This called for a luxury bivvy. I waited until I reached a little copse that looked good to set myself up in. I stomped down a trench of snow wide enough and long enough for my sleeping bag, then widened the head end to make space for my stove. I gathered thin branches from the trees and lay them down with my thermarest on top. With food, stove, and other bits brought over from the bike, I lay down in my big comfy sleeping bag. Before sleeping, I had to melt snow and used the opportunity to boil the water for hot water bottles in my bag. One bottle right down by my feet – they weren’t going to get more frostbitten tonight! I ate muesli and eventually went to sleep. No alarm, I’d sleep until my body was ready to go on, whenever that was. Thinking “race” had got me sleeping here instead of the checkpoint, so I wasn’t messing around again. I awoke hot and claustrophobic. A mummy sleeping bag and the blackout sleep of the exhausted make for a confusing moment on waking. Sticking my head out a bit, I could feel it was colder now, and things looked good. Back up the trail, I could see a pair of riders. Probably Eric and Lou. I packed up and hung around for a minute to chat. They told me Billy had set off as well and was making good progress. With their non-snow tyres, though, Eric and Lou were having to push a lot. It was good to see them, but time to move on and make my fat tyres work. I dropped the pressure and pedalled off, leaving them to their push. Once more it was cold and lonely riding through the night. I hoped to catch up with Billy again and cross the line together, but all I saw was endless winding rivers and his tyre tracks. It was iPod time. In that moment of cold, of alone, and of dark some things stood out. Aesop Rock‘s convoluted lyrics and beats kept me positive. Mayhem finally made sense. Bad Religion seemed a little out of their depth. I could ride the trail, but it was pocked with moose tracks. They had walked through during the day and left lots of tiny deep holes with their tracks. Each one sent reverberations right though me. After miles of this frustration, I came across a snow bank with “F**KING MOOSE!” written in it. Obviously, Billy was thinking the same thing as me. I was getting closer, but the night was getting colder. The air in my rear tyre was contracting to dangerously low pressure. I had to weigh it up: try to use my faulty pump and risk losing what pressure I had, or just keep going. I decided to try to warm the pump up under my jacket for a while then try pumping. I attached the pump and pumped it for all I was worth, immediately popping it off when my arms gave out. The tyre seemed, if anything, flatter than before. I tried again, still no big change. I gave up. If the tyre gave up too, Eric and Lou would catch me up and I could use their pump. If not, I might chance my way to the finish on a squidge of air. Riding gingerly, I came out of the little clump of trees where I’d stopped. Only to find Billy bivvied around the corner. His bike and bag had been thrown down in a hurry. I wanted to see if he was ok (and, yes, I wanted to see if he had a pump) so I woke him up. Fortunately, he was glad I did. So I pumped my tyres, and we set off to ride out the remainder. Billy had fallen asleep while riding and decided to bivvy right then and there. It seemed unbelievable, but following him now, I was just about holding my lids open. If we could make it to day-break, we’d make it to McGrath. Eventually, the day came and the sleepiness receded. We’d made some miles and started to look forward to gorging ourselves at McGrath. Now it was time to go with all the speed we could. Unfortunately, that speed was too much and we missed a cardboard sign that had got folded over. We went into McGrath along the river, where the sign had directed us off onto the road. With only the hint of a trail, the river was hard work. Tens of metres, then sinking into the snow. Every section done on the bike was on the limit of being able to ride. After about 40 minutes, we saw a snow machiner and he told us that we had taken a wrong turn but it was about the same distance to carry on now. So carry on we did. An hour later, the GPS said we were no closer to McGrath and we cursed the guy. For the next few hours, we cursed the snow, the river, the sky, the earth, the snow machiner as we battled on. It was a horrible and deflating end to the event, but we overcame it and eventually rode down the main street of McGrath. We got to Peter and Tracy’s house together to find a massive table of food and a room full of racers relaxing. It was done. I chatted and ate, and eventually went upstairs to see Kathi. When I got there, I saw a pile of my clothes. I asked her about it, but she pretty much ran away. Back downstairs, I saw Emily’s boots. I thought those two must have got on well and traded boots. Then it dawned on me, Emily must have been in McGrath. It wasn’t long before she walked through the door and our hug marked the real end. It was a moment I had been looking forward to for days. She had been out looking for me and Billy as we had been so overdue with our river diversion. But everyone was together now and I had finished my journey. Iditarod was spectacular and tough. It taught me how far I could go on willpower and preparation. It taught me how fantastic some people in this world are (and how those who push themselves to extremes tend to be in that number). I will be back for Nome. Oh boy, nice to finally follow you to the end. Thought you (and Billy) might be stuck out there in virtual Bison/Buffalo camp forever.